Sisal runners not only look great they also offer an Eco friendly way of decorating our homes. 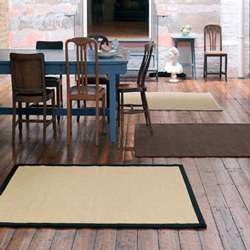 Sisal mats and rugs are made from plant extract which is ideal for the planet conscious customer. Our Sisal range features a cotton border which is coloured to add to the runners overall appearance, each runner has an anti slip latex backing.